→ Forum Event: Design a Mount! So, as much as I am a bit frustrated by the lack of attack abilities and the temporary period for ownership...I did have a few ideas that I wanted to toss into the fray. So here they are. 2 poor sprite edits because I was admitably a bit lazy and also because I am short on time at the moment... and 2 quick doodles. 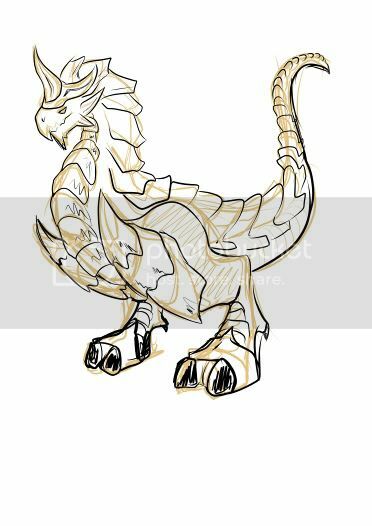 Mount concept: Described in mythology as a wingless bipedal dragon. This isn't your typical ferus. I based the sketch on RO's Nidhoggur. Perhaps a relative of the dragon chewing at the roots of Yggdrasil. 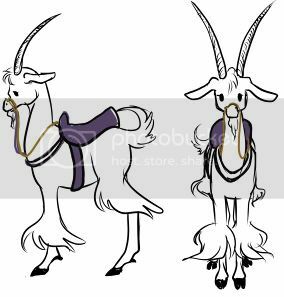 Mount concept: This was a goat that lived in Valhalla. I thought it would be a bit cuter than your usual goat... gave it a more unicorn look. Almost wanted to call her Amalthea after the goat that fed Zeus in Greek myth. Class that rides: Assassin or Rogue classes. Mount concept: We have Hatii. Why not add his brother into the mix? Hatii doesn't do much moon chasing. At least Skoll could be traversing the world with the greatest adventurers, still hunting down the sun. Mount concept: The Midgard serpent. A badly edited Evil Snake Lord...but you get the idea. It would obviously be a large dark snake. ESL's size would be the approximate size of the mount. Perhaps a bit smaller to accommodate screen size. Thanks for the consideration for this guys! Edited by Callie, 28 October 2010 - 02:20 PM. Man, I wish they made Sage classes a summoning class instead because I'd much rather have all of those as summons than mounts. Back to Forum Event: Design a Mount!